This week the Horror Duo conclude their exploration of 90's superhero movies. 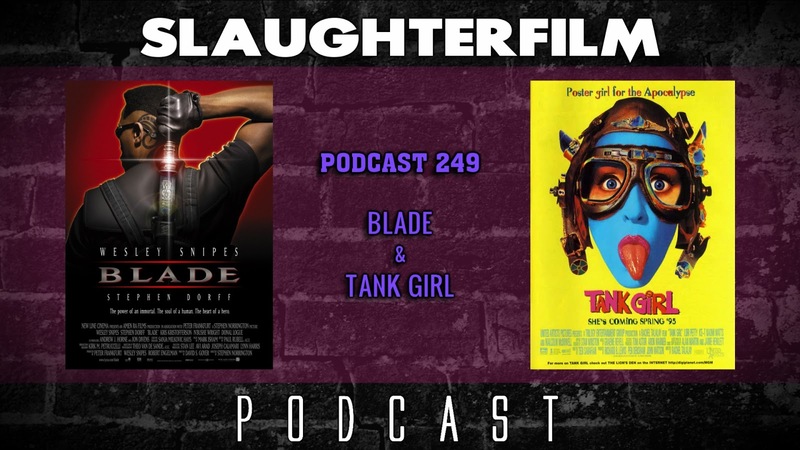 Forest shares his thoughts on the gothic, techno-rave fueled adaptation of Marvel Comics' Blade. Cory endures a flamboyant punk landscape of the futuristic dystopia that is Tank Girl. Cory talks about seeing Pauly Shore - the man who built MTV - at Jr's Last Laugh Comedy Club and Forest defends the merits of Shore's Encino Man. Cory just might subscribe to Shudder just to watch Ken Russell's The Devils, and hopes that maybe someday the same will be true for Crispin Glover's films. They also weigh in on what advances should be made regarding female filmmakers and lady superhero films. For more Slaughter Film news and reviews, as well as show notes and special events, make sure to visit our website; SlaughterFilm.com.